The Sennheiser e 608 Dynamic Instrument Microphone is a miniature microphone specialized for capturing wind instruments, brass, percussion and drums. 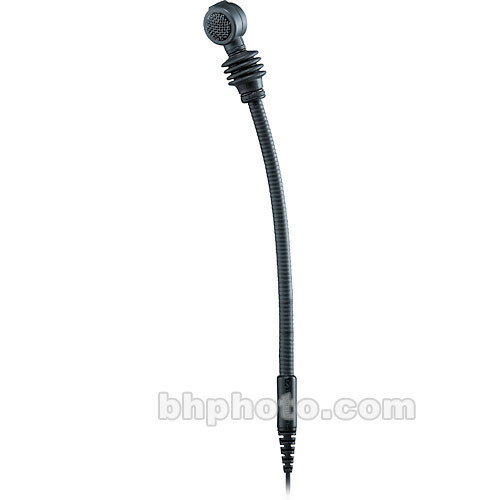 The e 608 features a miniature supercardioid element, mounted on an adjustable gooseneck. The gooseneck mount allows for inconspicuous placement on instruments and easy adjustments of positioning. The supercardioid polar pattern is most effective at eliminating off-axis ambient sound that can cause feedback and residual noise. The dynamic element is capable of being placed in close proximity to excessively loud instruments without resulting in noise or distortion. The e 608's rugged mount is designed for firm placement on instruments during lengthy performances. The e 608 miniature dynamic microphone is specialized for capturing wind instruments, percussion, drums and brass instruments. The miniature profile allows for inconspicuous placement during performances. The supercardioid polar pattern is effective in rejecting off-axis signal and noise. The adjustable gooseneck provides accurate positioning. The dynamic element is capable of handling extreme sound pressure without noise and distortion. Box Dimensions (LxWxH) 10.0 x 4.75 x 3.1"